Made entirely of repurposed junk mail, Swarm A celebrates the concept of diversity within unity. No two bees are alike, even though they were folded from squares of the same size, following the same sequence of folds. Slight variations of angles created a variety of wing span and shapes, bringing rhythm and energy to the swarm’s primal dance. 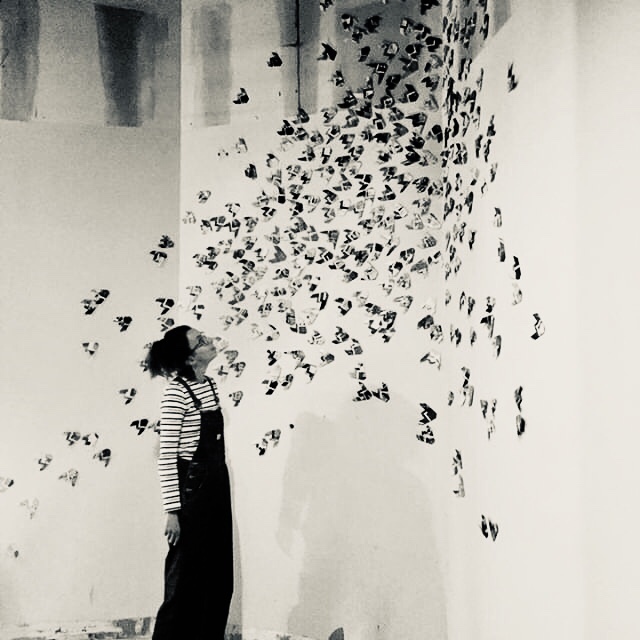 The installation is currently on display at the Better World Museum, downtown Minneapolis, where visitors can enjoy a variety of free, participatory art experiences, including a chance to fold a junk mail bee following easy, step-by-step instructions. Two weeks have now passed since the installation was completed and many bees have been folded. A young visitor even came up with an alternative way to fold a stylized bee and drew a folding diagram on the spot! This is exactly why I do what I do: spark curiosity, start conversations and take baby steps towards a more inclusive, multigenerational community, as vibrant as a swarm of bees! Alternate way to fold a bee imagined and drawn by a young visitor.